The number of GBC approved providers in North America has grown from 1 in 2006, to more then 340 today, operating in 41 states and 6 provinces of Canada (this includes funeral homes, cemeteries, and product providers). 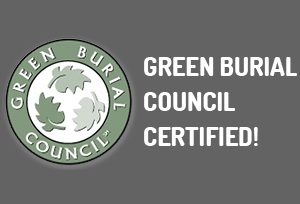 Certification by the Green Burial Council allows consumers to rest assured that the green or natural burial services that they are receiving have been thoroughly vetted against stringent and up-to-date standards – created and continuously reviewed by a team of environmentalists, scientists, lawyers, and representatives from the funeral industry. Use the map as found on the Green Burial Council website to ensure you are getting the most updated information.